Asbjorn Lonvig's words: You will really enjoy the spectacular Wilderness National Park between Cape Town and Port Elisabeth. Asbjorn Lonvig's words: Acacias are the Giraffes' favorite dish. "South Africa Mosaic 2010 I"
Asbjorn Lonvig's words: A mosaic originally inspired by mosaics at Museo Nazionale Romano Palazzo Massimo Alle Terme in Rome, Italy. This mosaic is inspired by the 2010 FIFA World Cup South Africa. 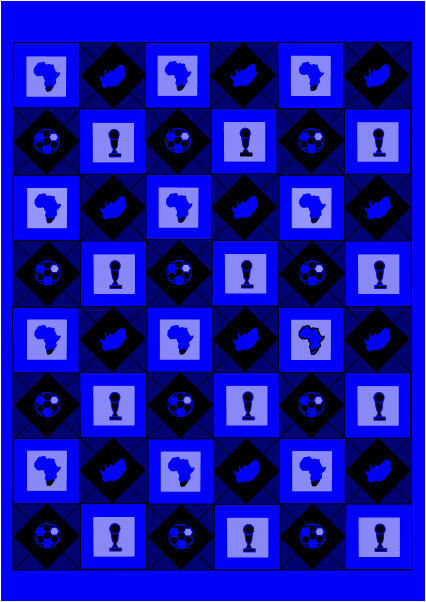 One square has a map of Africa with South Africa in blue. Another square is the shape of South Africa. The third square is a soccer ball. The forth square is a double soccer field. I know about an explorer that drew in his car down through the African continent from the Strait of Gibraltar to South Africa. He told that everywhere kids were playing soccer. To accommodate all the soccer playing children the soccer field is a double field. Double Soccer is the name of the game. There are 4 goals. Two balls in different colors. I have established a Facebook group to form the exact rules. As a point of departure I have mentioned a few keywords to the Facebook group members: Fun, fast, exhausting, tactics, strategy, chess, exciting to look at, appealing to electronic media”. The imaginative kids of Africa will probably some day amuse themselves by playing double soccer. 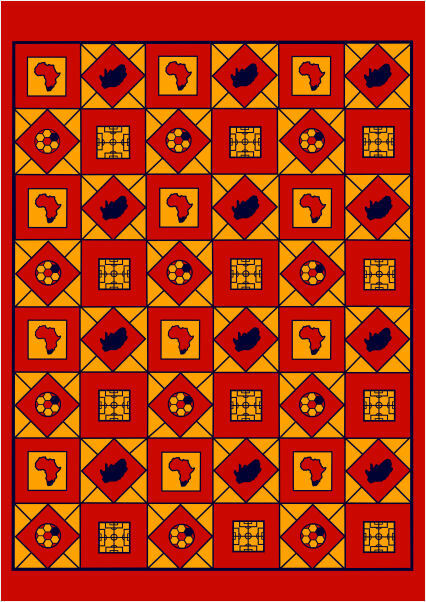 "South Africa Mosaic 2010 II"
One square has a map of Africa with South Africa in blue. Another square is the shape of South Africa. The third square is a soccer ball. The forth square is the FIFA World Cup Trophy. 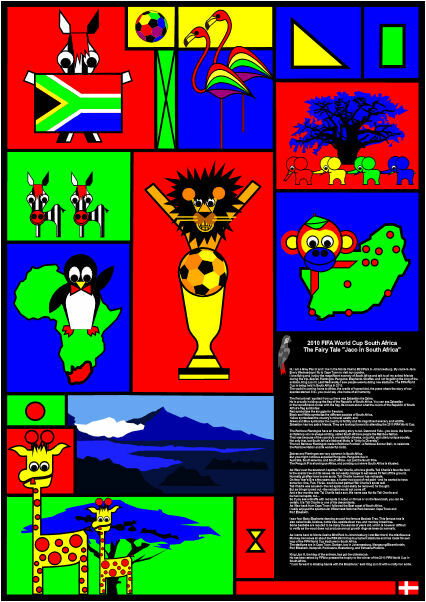 The 2010 Fairy Tales, South Africa: "South African Joy"
A South African Art Publisher MMX Art in Cape Town contacted me. MMX Art alias 2010 International Fine Art is licensed to use the phrase “Official Licensed Products of the 2010 FIFA World Cup™” by FIFA. 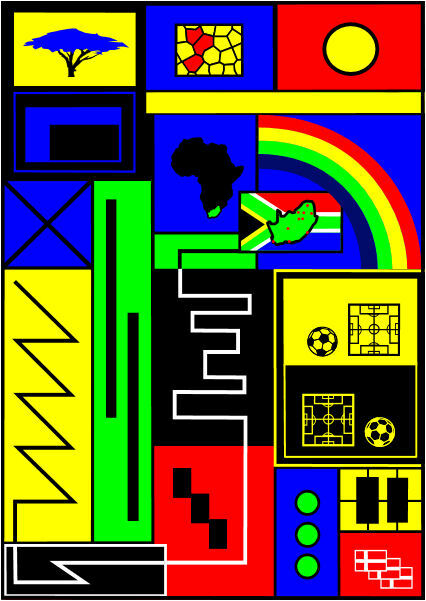 5 artists from each of the 32 qualifying countries to 2010 FIFA World Cup South Africa™ were selected to participate in the 2010 International Fine Art project and form the 2010 International Fine Art Collection. “The world is coming home to Africa, the cradle of humankind, the site where the story of our species started. It is – in essence – the home of all humanity. It is also the location for the greatest sporting event in the world – the 2010 FIFA World CupTM – the first time in its history that the tournament has been staged in Africa. The Acacia tree and the Baobab Tree are significant trees in South Africa. I am looking for my inner giraffes eat the leaves of the Acacia tree. The South African Savannah in the East, the bush and dessert in the West are the domicile of a lot of exotic animals such as Zebras, Flamingos, Elephants, Lions, Penguins, and Giraffes. To me the most outstanding of them is the Giraffe. In “South African Joy” symbolized by a giraffe skin. The sun is important to all of us. In most of South Africa there is subtropical climate witch has an impact on everything. On nature as well as on people’s conduct and behaviour. From maps we know the shape of the African Continent. From the name we can guess where South Africa is, but I did not know exact shape of South Africa on beforehand. Desmond Tutu – you know, the former archbishop who is always talking and always smiling – called South Africa’s people the Rainbow Nation. That was because of the country's wonderfully diverse, colourful, and utterly unique society. You may percept many different run patterns in “South African Joy” – run patterns of players’ movements as you will see them on the stadiums of South Africa. Zigzag, forth and back etc. Stepping up the stairs – maybe reaching fame. Some day an African nation might win the Soccer World Cup. The 2010 Fairy Tales, South Africa: "Jaco in South Africa". Hi, I am a Grey Parrot and I live in the Monte Casino Bird Park in Johannesburg. On Wednesdays I fly to Cape Town to visit my cousins. I love to fly and I enjoy the magnificent nature of South Africa and I talk to all my animal friends during my trip. Zebras, Flamingos, Penguins, Elephants, Giraffes and not least the king of the animals King Lion III. Last Wednesday I saw people were building new stadiums. The FIFA World Cup is taking place in South Africa in 2010. The world is coming home to Africa, the cradle of humankind, the site where the story of our species started. It is - in essence - the home of all humanity. The first animal I spotted from up there was Zebastian the Zebra. 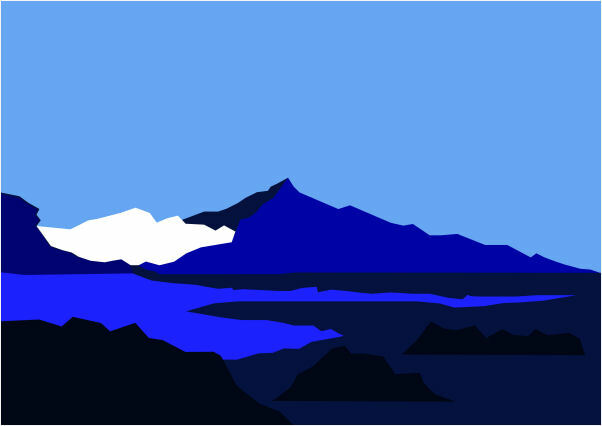 Yellow symbolizes the mineral wealth, and Green and Blue symbolize the fertile land, the magnificent nature. Zebastian brings two zebra friends. They are eager to attend the 2010 FIFA World Cup. people the Rainbow Nation. That was because of the wonderfully diverse, colourful, and utterly unique society. And did you know, the male Rainbow Flamingo asked, that the national motto of South Africa is "Unity In Diversity". Zebras and Flamingos are very common in South Africa. Australia, South America, and South Africa - not merely at the South Pole. The Penguin P shows us Africa, and he points out where South Africa is situated. As I flew over the savannah I spotted Tall-Charlie, he is a giraffe. 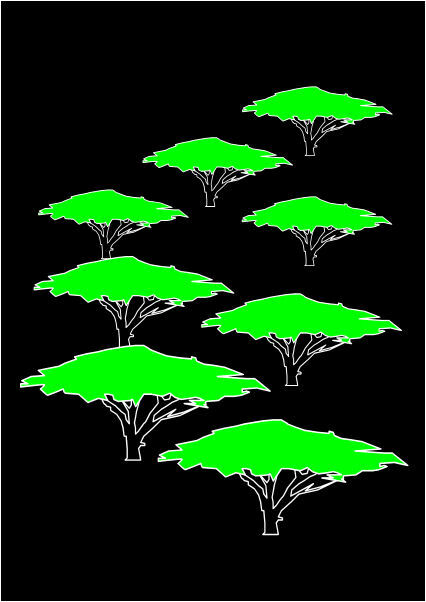 Tall-Charlie’s favourite food is the acacia tree and its leaves. He easily can manage to eat leaves 18 feet above the earth. Normally giraffes have brown spots. Tall-Charlie however has red spots. On New Years Eve a few years ago, a hunter had a pot of red paint - and he wanted to make some fun. One, Two, and three – soon he had painted Tall-Charlie’s spots red. 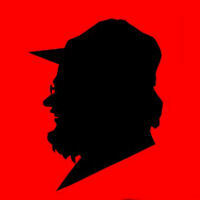 Tall-Charlie was amused - the red spots were easily removed - he believed. But it showed - he could not remove the red paint. And a few months later Tal-Charlie had a son. it is Tall-Charlie or a descendant of Tall-Charlie. As I flew back from Cape Town I flew along the eastern cost line of South Africa. I really enjoied the spectacular Wilderness National Park between Cape Town and Port Elisabeth. I saw 4 baby-elephants dancing around the famous Baobab Tree. This famous tree is also called boab, boaboa, bottle tree, upside-down tree, and monkey bread tree. Some baobabs are reputed to be many thousands of years old, which is however difficult to verify as the wood does not produce annual growth rings as trees do normally. As I came back to Monte Casino Bird Park in Johannesburg I met Bernhard. He knows about the FIFA World Cup tournament stadiums. He has made his own map of the FIFA World Cup stadiums in South Africa. Port Elizabeth, Nelspruit, Polokwane, Rustenburg, and Tshwane/Pretoria. King Lion III, the king of the animals, has got the ultimate job. He has been asked by FIFA to present the trophy to the winner of the 2010 FIFA World Cup in South Africa. I look forward to shake hands with the Brazilians, King Lion III said with a cunning lion-smile. Fine Art paper using pigment based archival inks for pigment load maximization and lightfastness augmentation. Processed with Hahnemühle Protection Spray.